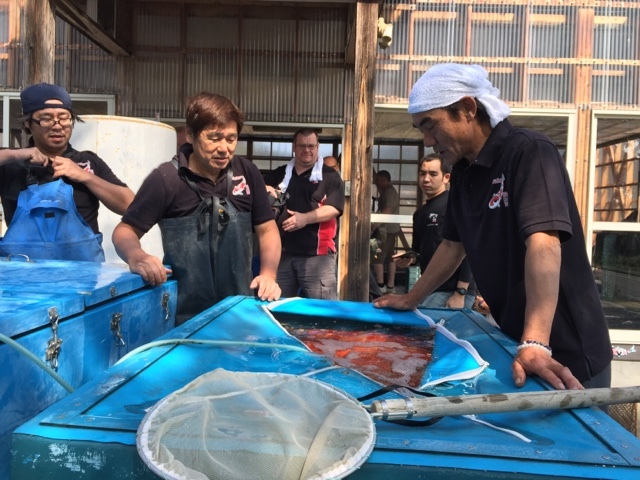 My first full day in Japan, and I attended a harvest, an auction and we visited several koi farms - probably 10 or so! its going to take some days and probably weeks and months after this trip for me to reflect properly on the experrience, so for now - here s a diary of the day. 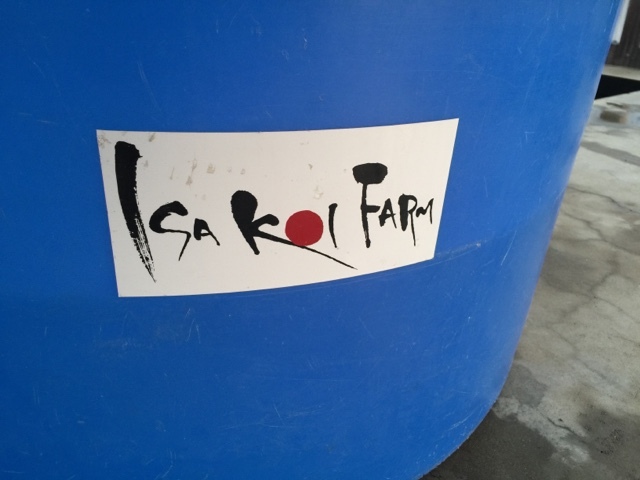 We started today with breakfast at the hotel.. and some familiar faces from the few hours spend in Niigata farms the previous day were present, and it was good to catch up with a few of those hobbyists and dealers from around the world. 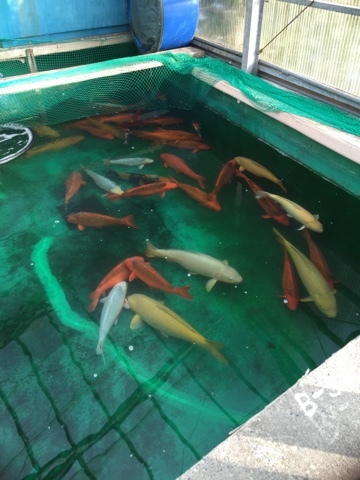 We headed to Shintaro first thing, met up with another 10 or so people then drive for 15 mins to one of Shintaros ponds that must have been several acres in size - and had just 66 sansai and older koi in it! 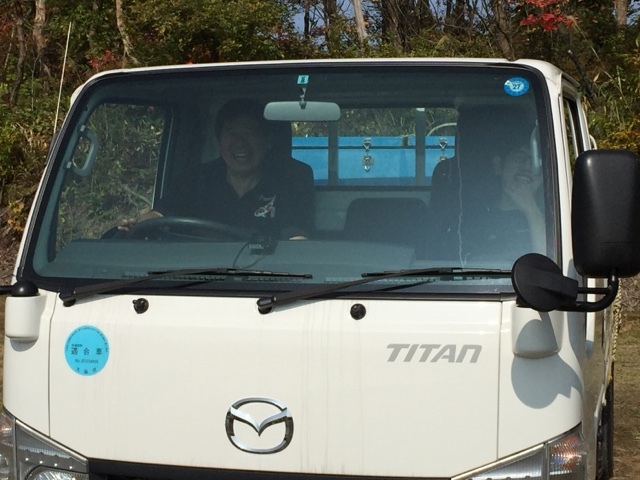 Shintaro san with his son, driving back to the farm with 66 large go sanke in two tanks on the back of the truck. 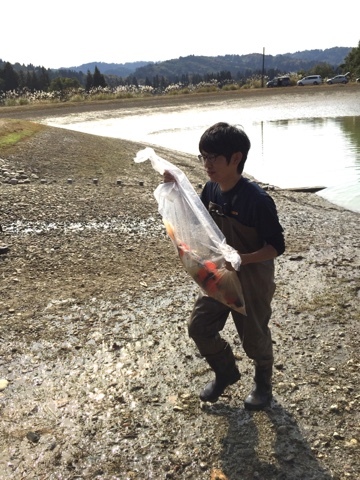 Shintaro, his son and their team of local and overseas helpers netted the pond and had the 66 koi harvested in quick time. There were photographers from around the world vying for the best shots and how lucky was I to be in attendance, and just take the whole thing in as a koi experience. 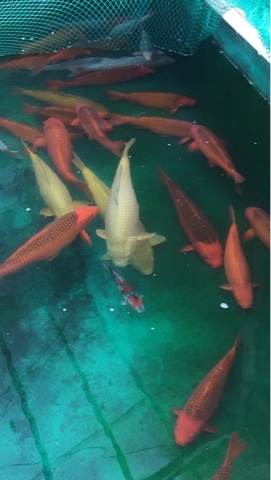 There was a general feeling amonst the people there that the koi had grown well this year and I will add that the skin quality was impressive on most of the koi, especially consiering the koi will look much better a week or two after being harvested. 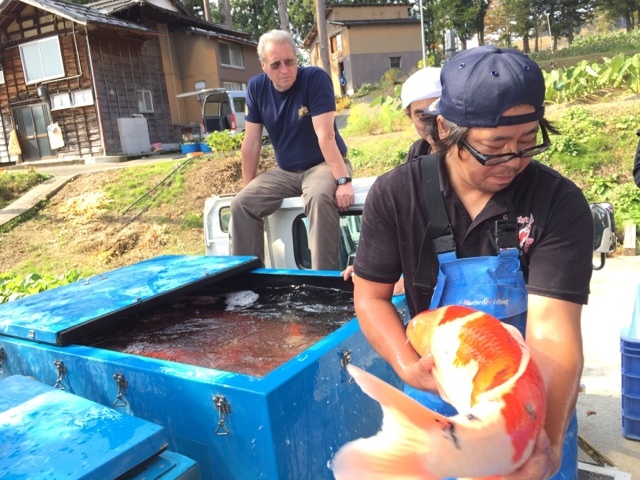 Once harvested, the whole group drive back to Shintaro's fish house in Mushigame and the koi were moved by hand into an inspection bowl, and then into one of the tanks in the fish house. There were some fantastic specimens there, and its so difficult to capture that properly on camera, but hopefully this short video gives you an idea. 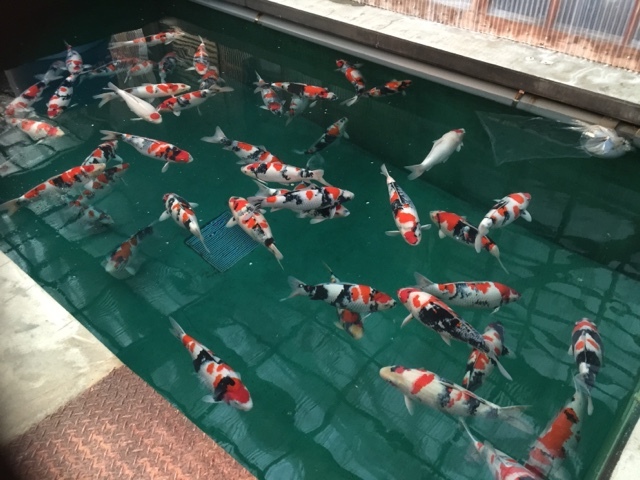 Gary and I spent some time watching the koi in their new tanks, before heading into the mountains where we stopped at koi farm after koi farm. I cant remember all their names, but the first stop was Yamamatsu. When you think Yamamatsu, Sanke often comes to mind. And there were some great examples there, but I was also suprised by some really interesting examples of shiro. I took a short video to give you an idea on some of the larger examples the farm had in today. 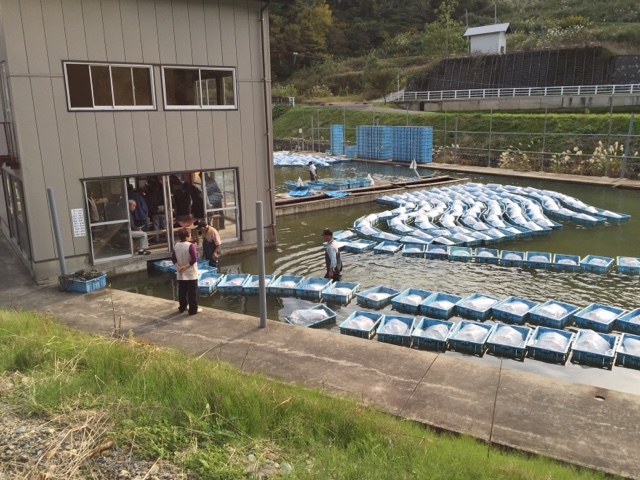 We saw Ikarashi and a few other koi farms, and then arrived at the premises of Aoki. 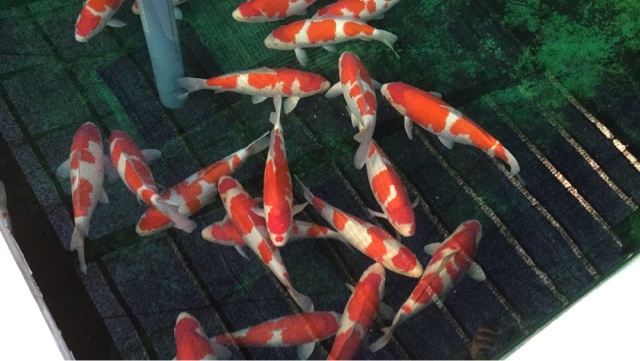 I gather this is a different Aoki to the one we often hear about in the Uk, and it was a small premises - but we found some interesting example of koi varieties that you dont normally see -such as these ki matsuba, and gin rin ki utsuri. 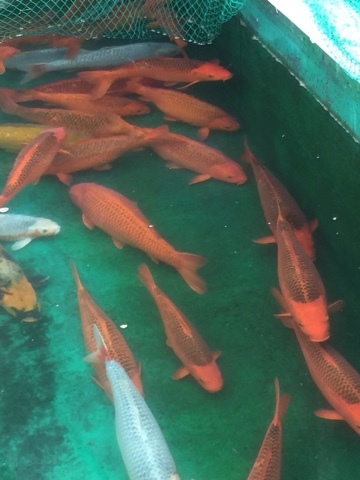 After Aoki, we continued through the mountains stopping here and there, and I cant remember the exact order of things, but we soon stopped at a koi auction house - which is basically a large lake, with a house adjoining one bank, but set inside the lake. The house has banked seating and the lake runs through the base of the house, like a river. 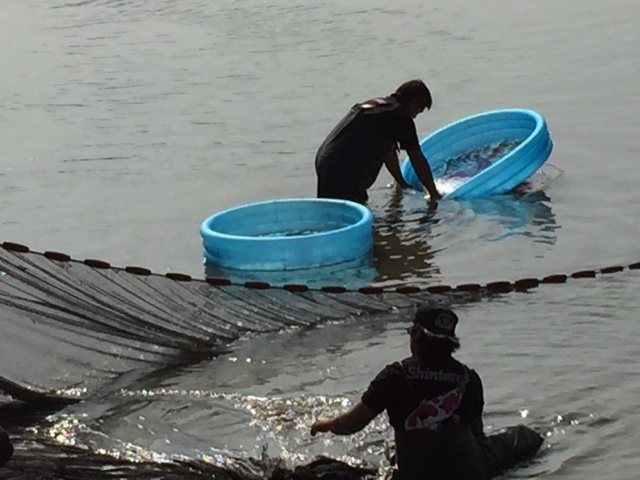 The koi being auctioned are in plastic bags - each wth a referene number, and each in their own floating basket. 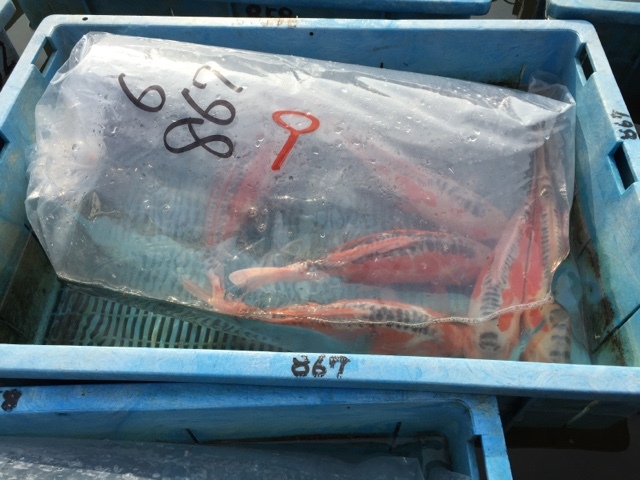 Basically - the floating baskets are fed through the auction house; bidding happens as they pass through, and the winning bidder's customer number is written into the bag, and the floating basket is then laid up in a kind of floating basket dock. I took some video which gives you an idea of the scale, and the process. 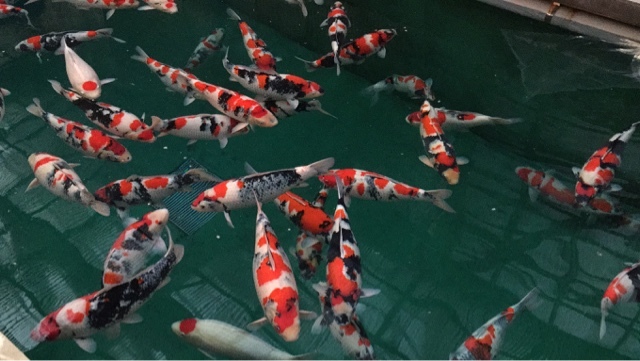 Walking around the facility, I was conscious to not make any sudden moves with my hands for fear of ending up with a bag of koi ! I was left speachless ... Ive never seen anything like it. I guess we were lucky to be passing by at the time when the auctions were underway - and then we just parked up and looked around. 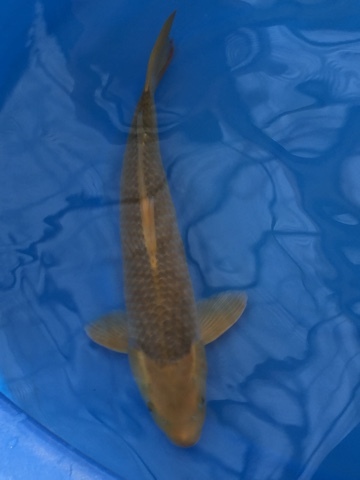 The koi were packed into the ponds in their fish house, and there were lots of large fish on display - and some clean and large examples of hi utsuri stood out. As well as aka matsuba, and ki matsuba. 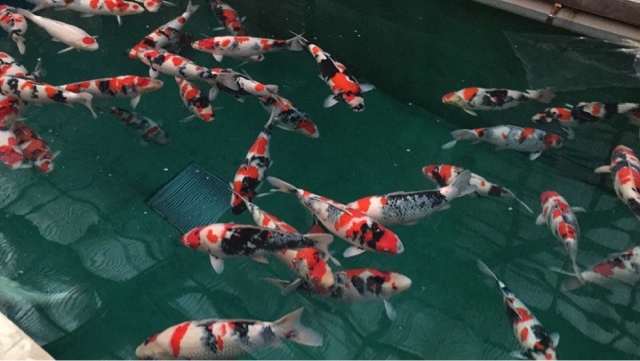 To be honest, I think given more time and an inspection bowl, we could have found lots more examples of interesting koi here. 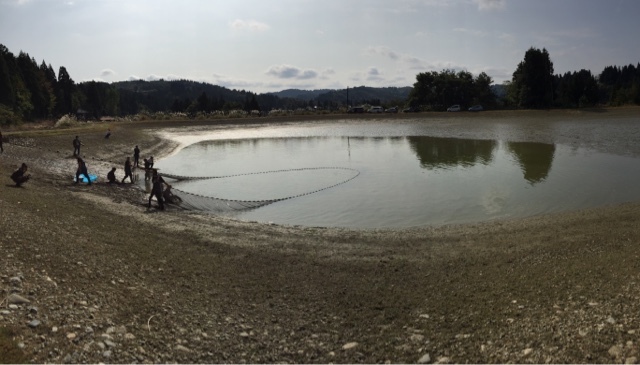 But we moved on, stopping at a dry goods outlet.. where I bought some selection nets, and then onto the final farm of the day which had the 2 ponds I enjoyed viewing most from the day; the sansai pond, and the yonsai/rosuksai pond. I've took some video footage, which gives you a feel for it. 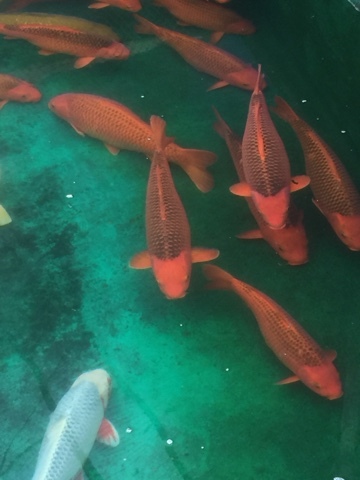 The skin quality on these koi stood out, as did the body volues. And, the patterns were very pleasng too. 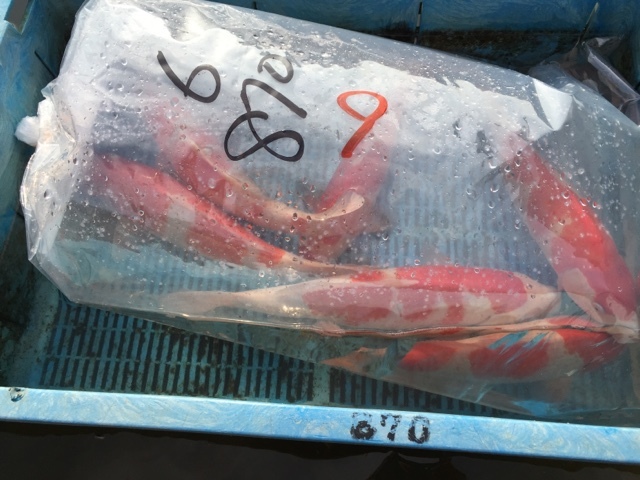 I'd cite it as a goto destination in the area, and they told us a harvest of large kohakus is due later in the week, and we might get a chance to re-visit before I have to leave. Gary's navigation skills in the car have been faultless! And I'm starting to get a feel for the area too now... its been another superb day.